I saw this copper vase tutorial over on A Merry Mishap and was instantly inspired, for a few reasons really. I saw that glass beaker, and my heart skipped a beat! As a former science teacher, I adore glassware. I’ve got one that a friend gave me as a present, and I just can’t muster the courage to paint it! 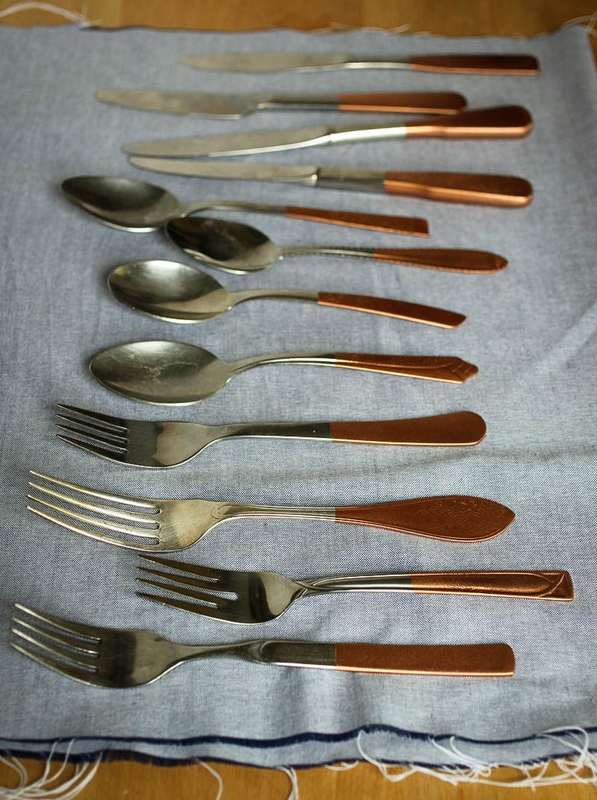 I never really was a fan of copper – I’d throw pennies in the garbage because I hated copper so much, actually. Okay, that’s a lie about the pennies and the garbage. 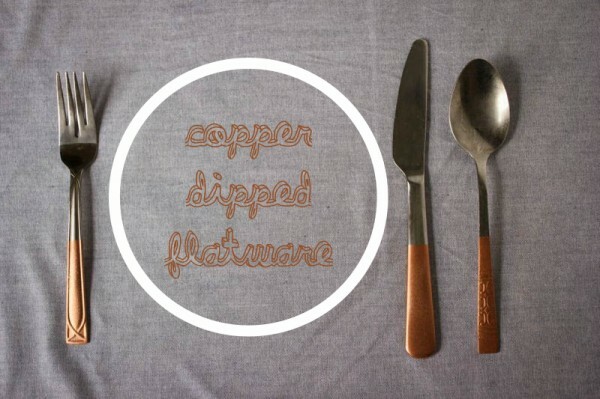 But really, I wasn’t a fan of copper until I met Dan, my husband. His degree is in ceramics and metalsmithing, and the dude loves copper. 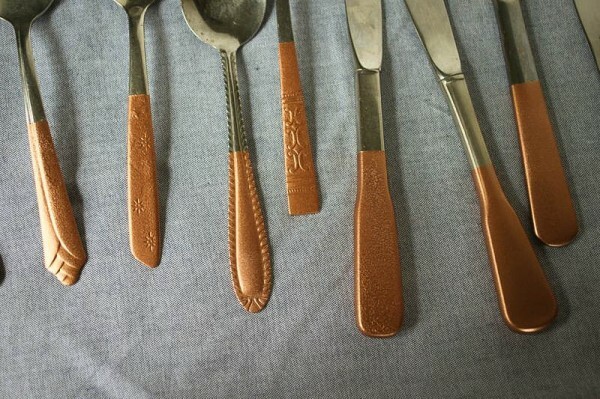 The first thing he ever made me was something made with that glowing metal. So, of course I loved it. I’m not a jerk. I’m not going to hand something back, letting him know I hate copper. Turns out, I just needed some beautiful art as a gift to make me love the stuff. Since I couldn’t paint the glass beaker, and I’ve been getting sick of my silverware lately, this seemed like the perfect fusion for me. 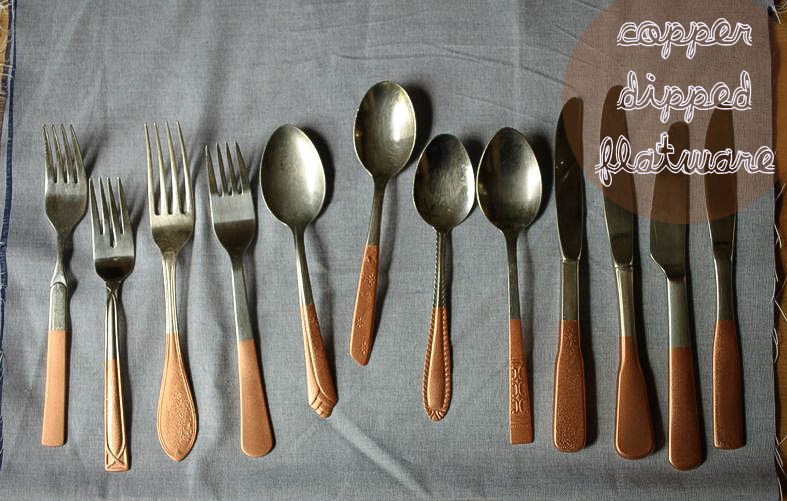 I am always eating, so I’m always using silverware, and I’ve been using the same forks, knives and spoons for nearly five years. It’s about time to mix it up! At the thrift store I got four of each type of flatware at a whopping 29 cents each! 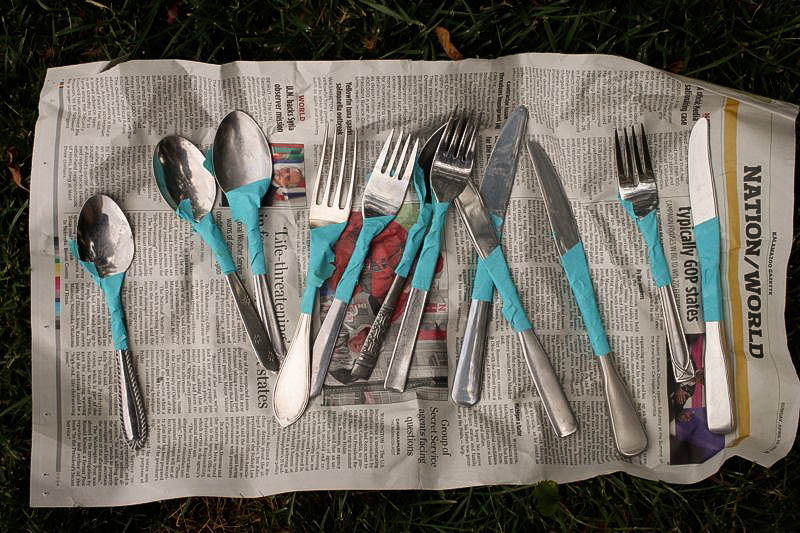 The process is simple: Wash & dry the flatware, tape off the desired section (a little variance in how much you tape off is fun), spray paint, let dry completely, then pull off the tape. I’m not sure if this is necessary, but I’m going to let mine set up for at least a day before I use them. Simply by the process of uniformly making the copper “dipped” ends for each piece, they look like a real set! I love it! I think I’m going to make a couple more sets in different colors! I’m addicted! Whenever I find a project that is quick and affordable, I have the urge to make some for anyone and everyone, and for any and every occasion! Father’s Day! The Fourth of July! Christmas! Christmas in July! Birthdays! Unbirthdays! What a clever idea! 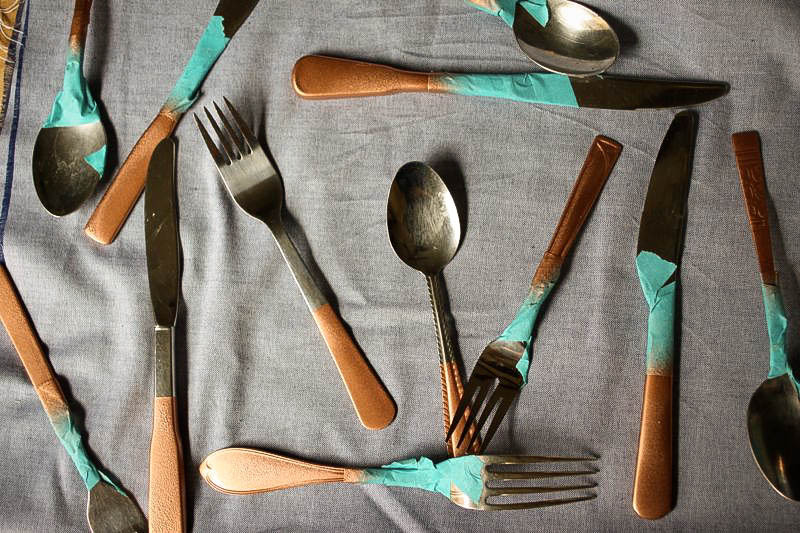 I am also tired of my flatware and this is a great way to spruce it up. After the paint, are they hand wash only?